Delivering the Ultimate Bar Mitzvah & Bat Mitzvah Party Experience in the Seattle Area! The Premier Entertainment Party Experience! Every Premier Entertainment party starts with a great MC... add the most entertaining, talented party dancers and motivators... top it off with the sharpest Disc Jockeys... You've got the party of a lifetime! 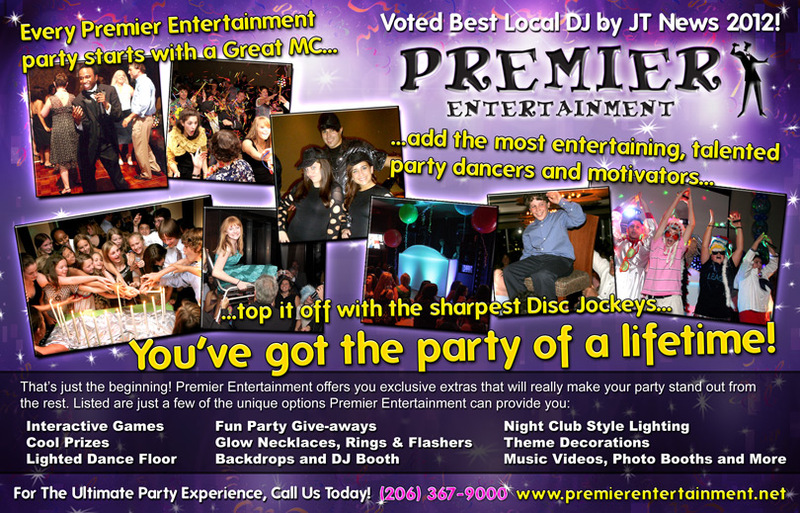 Premier Entertainment offers you exclusive extras that will really make your party stand out from the rest. Music Videos, Photo Booths and More! For The Ultimate Party Experience, Call Us Today! Simply put, this is the best DJ style entertainment you can have for a B'Mitzvah. The music will reflect your family’s personal choices and the MC will ensure that everyone has a wonderful time. All Special Effects and Light Show Options may be added to any package. All Custom Options may be added to any package.